In last week’s encounter we reported on the steadily falling rates of Catholic Marriages across Australia. In the face of such grim statistics it is good to remember Pope Francis’ advice in Amoris Laetitia: “There is no sense in simply decrying present-day evils, as if this could change things…What we need is a more responsible and generous effort to present the reasons and motivations for choosing marriage and the family” (AL 35-36). The Pope also declared that “we need to find the right lan­guage, arguments and forms of witness that can help us reach the hearts of young people, appeal­ing to their capacity for generosity, commitment, love and even heroism, and in this way inviting them to take up the challenge of marriage with enthusiasm and courage” (AL 40). In an attempt to discover how we can better encourage and accompany married couples at a local level, the Archdiocese of Canberra Goulburn is running a “Marriage as Mission” Afternoon Tea at the Haydon Hall in Manuka on Sat 2nd June from 2-4pm. The hope is to draw together married couples from across the Archdiocese who can share ideas and learn about initiatives already taking place to better support marriages. 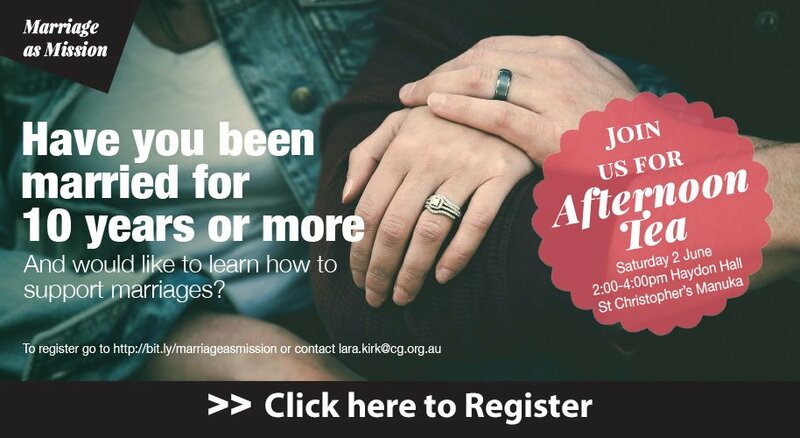 If you have been married for 10 years or more and would like participate please register here or contact lara.kirk@cg.org.au 0429 192 869 for more information.